Purchase the PAW Puppy Shampoo and PAW Puppy Conditioning Mist or the PAW Sensitive Skin Shampoo and PAW Sensitive Skin Conditioner for your pet and get a 200ml PAW Lavender Grooming Mist for FREE! Take advantage of this great deal and spoil your pet with products that will have them looking shiny and smelling great too! Be quick as this offer is only available until late November or while stocks last. 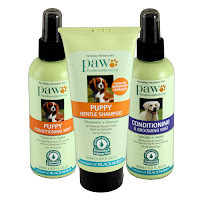 Purchase the PAW Puppy Grooming Package Now. Purchase the PAW Sensitive Skin Package Now.